GTO, Fish, and whatever: Time For A Maid? 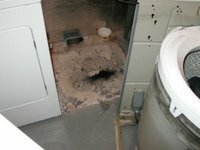 Our washing machine konked out on me while I was washing a load Tuesday night. When I pulled the thing out away from the wall to have a look at it, I saw this. And my wife had told me earlier that she cleaned the house last weekend! I'm just glad we didn't have any guests over last weekend, because one of them might have slipped in the laundry room and fell, landing next to the washer and while they were down there, accidentally glanced underneath it and seen that mess. How embarrassing that would have been! I always say, "If you can't keep the area underneath the washing machine clean, then why even bother cleaning at all?" I'll make sure she sees your blog today. Maybe you'll be hiring a maid to clean your "dog house". Definitely better than kerux's ankle shots. oops! How did I not see this coming? I don't know if it's better than the ankle shots, but what I do know is that I didn't have to preach the next day. Boy, the suffering that man endured for the sake of the gospel, huh? What a guy! What a fine example of a man, and with hardly any complaining.